What the heck is an access aisle? To be fair, I didn’t know the term and had to look it up. I refer to it as “the stripey space between handicapped spaces”. In looking up the name, I also found fun facts: next to normal spaces it is five feet in width, and next to van accessible spots, it has to be 8. Like I said, fun fact. What other people seem to think it is called is “shopping cart parking”. I’m guessing they walk by with all of the store bought wares, unload in their cars and then think “Hmm, the blue stripey lines clearly indicate that shopping carts go here.” I see why they could think that: there’s 5 or 8 feet of free space with no car. Granted most lots have at least one or two cart corrals. But, the blue stripey spaces are normally more conveniently located near the front of the lot. You’d have to walk a whole aisle over to get to the corrals! 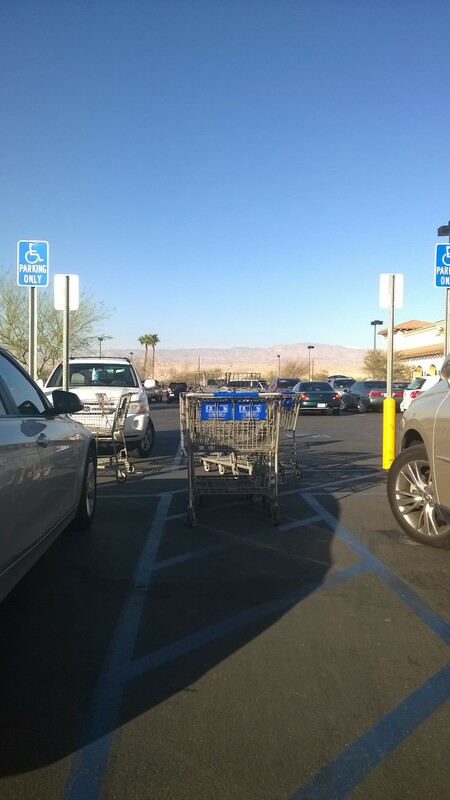 It may not seem like the biggest problem to leave a cart in the space. Are those really important anyway? Short answer: YES! They’re more than just a buffer to keep my car ding-free. It’s the space where I need to put why wheelchair to put the wheels on to, you know, get out. It takes room to put my wheelchair together. An able bodied person can squeeze through a tight space and move the carts out of their way. If there’s a cart blocking the path, I’m stuck. Literally. I can’t get out. 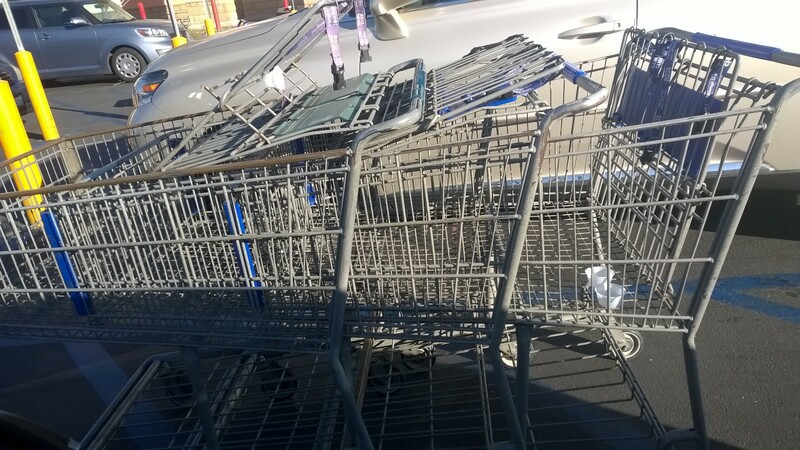 These carts were left right between the two cars. If I had been the driver in the car in the picture, there would have been no way for me to exit my vehicle. As you can see in this picture, the carts take up almost the entire stripey space. There is no way for a handicapped person to get out of their car if those are left there. Further, the stripey space in some lots serve as a pathway for wheelchair users to go without having to maneuver around or play chicken with cars. It’s our “safe space”. It seems to be common sense, but maybe it’s something that needs to be pointed out: please don’t leave carts in the stripey spaces. I know it seems convenient for you, but I’m begging you! If I can’t park and get out of my car in the designated spaces, then I may end up parking next to your car. And I don’t think you’d like my wheelchair bumping into your car.